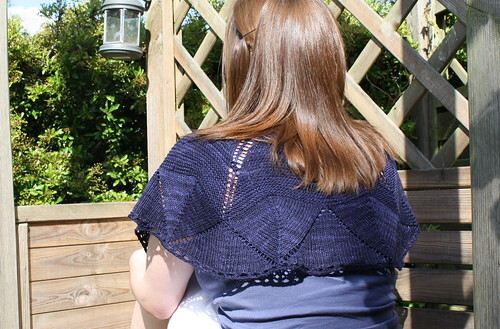 Here it is, fresh from the blocking you saw yesterday is my now completed Damson shawl. I have to say before I go on that I really do love this item, it is the first time I have knit a shawl and it has gotten me wanting to knit more, I have been wearing it all day today to show it off and am really proud of how it looks. Especially because of the mistakes and fixings i had to do! First off, after the good blocking I gave it yesterday my Damson measures 53" from point to point across the top and is 14.5" from the top to the bottom of the curve. This is slightly larger then the pattern states because I really wanted to open up the garter stitch a bit more, I like to be able to see the gaps between the rows of bumps. Now for the problems I had, I have mentioned already that I had to rip out a few rows a few times when my stitch counts wouldn't add up, well I had to do some more ripping at the end too. I used the recommended yarn for this project, Malabrigo Sock, and my gauge seemed fine when I tested it, but I must have been slightly off because I ran out of yarn 2/3 of the way through my bind off. I ripped back to bind off in a different yarn and it looked awful, so I ripped back to before the looped edging and was going to bind off there with a straight edge but I found that looked too plain, and then I started to use my head, I only needed a few more yards of yarn, and the last row of increases adds about 1/3 more stitches (off the top of my head) so instead of double yarn overs with knit 1, purl 1 into each yarn over, I instead did a single yarn over and knit 1 purl 1 into that single yarn over, reducing my stitches without losing the style. This is the finished result, and I think it has worked out very well. Unless you compared it with a perfect one you wouldn't really tell that there was a difference. I actually really enjoyed this learning exercise because I like puzzles, and knitting puzzles are the most fun. I may have gotten sick to death of tinking (and learning how to insert lifelines after the fact) but it was an experience anyhow! Problems: Lost track of stitches a few times, ran out of yarn at the end. 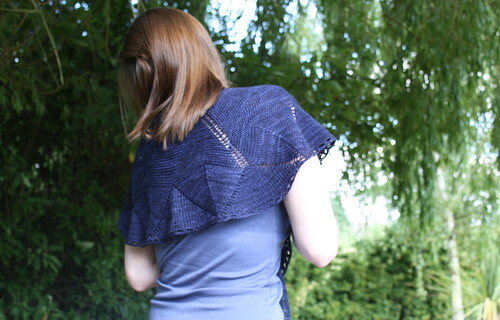 Skills Learnt: Triangular shawl construction. 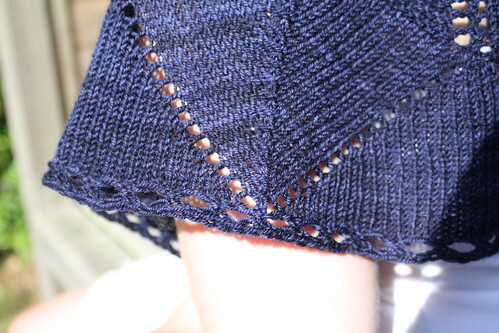 Blocking lace. Knit again: Probably but not for a while! P.S. In case you are wondering, those number play mats in the previous post are from Tesco Extra, they were £4.97, but I just got another set (because one was only just enough for the shawl and I might want to work on bigger things) from Sainsbury's, reduced for only £3 something, I would get them now if you are thinking of it as it seems they aren't available past the summer, I was looking last october and couldn't get any from anywhere! If you can't find any though, Silvia from over here suggested underlay squares for parquet flooring, so give that a go. P.P.S. Anyone else think it's weird that Toys 'R' Us don't sell these?! At all? !